313 Marlborough is located on the north side of Marlborough, between Fairfield and Gloucester, with 311 Marlborough to the east and 315 Marlborough to the west. 313 Marlborough was built in 1877-1878 by builder Daniel Weeks Beckler, one of four contiguous houses (309-311-313-315 Marlborough) built at the same time. Daniel Beckler was a builder and lumber dealer. In about 1874, he became the proprietor of Beacon Park, a trotting park and race track in Allston, and by 1875 he also owned a stable in Hancock Square in Charlestown. He and his wife, Julia A. (Judkins) Beckler, lived in South Boston in 1874 but moved soon thereafter to Winter Hill in Somerville. They also owned a home in Northfield, New Hampshire, where he raised thoroughbred horses. The land on which 309-315 Marlborough were built was owned by Harvey Jewell, a lawyer and former state legislator, who had served as Speaker of the Massachusetts House of Representatives from 1868 through 1872. He and his wife, Susan A. (Bradley) Jewell, lived at 204 Beacon. Harvey Jewell had acquired the property on June 10, 1869, from Franklin Evans. The land was part of one of several parcels originally purchased from the Boston Water Power Company on January 29, 1866, by a real estate investment trust formed by John Templeman Coolidge, Franklin Evans, and Charles Henry Parker. Click here for an index to the deeds for 313 Marlborough. Daniel Beckler bought the land from Harvey Jewell on October 4, 1874, and, at the same time, entered into a mortgage on the property with him. He probably had intended to begin construction of the houses at 309-315 Marlborough soon thereafter (in January of 1874 he had acquired the land immediately to the west, where he built 317 -319 Marlborough). He had overextended himself, however, and in late 1874 or early 1875, he declared bankruptcy. On April 12, 1875, Harvey Jewell took back the land, waiving his claims as a creditor in the bankruptcy proceedings but keeping the mortgage in effect to preserve his title to the land, which remained vacant for the next two years. Subsequently, Harvey Jewell apparently entered into an agreement with Daniel Beckler to construct the four houses at 309-315 Marlborough in 1877-1878 and also to build five more houses in 1878 at 302-310 Marlborough, across the street, on other land which he owned. Although he no longer owned the land, Daniel Beckler is shown as the owner of 309-315 Marlborough on the original permit application for the four houses, dated October 11, 1877. On March 16, 1878, Harvey Jewell foreclosed on his mortgage on the property to establish his title, and he is shown as the owner (and Daniel Beckler as the former owner) on the final inspection report for the four houses, dated December 30, 1878. 313 Marlborough was not listed in the 1879 and 1880 Blue Books. 313 Marlborough continued to be owned by Harvey Jewell and by the 1880-1881 winter season had been leased by retired dry goods merchant Henry N. Farwell and his wife, Clara (Richardson) Farwell. They previously had lived at 86 Mt. Vernon. They continued to live at 313 Marlborough in 1882, but moved to 139 West Newton by 1883. Harvey Jewell died in December of 1881. On June 6, 1882, 313 Marlborough was purchased from Susan (Bradley) Jewell by hide and leather dealer James P. Safford. He and his wife, Sarah A. (Green) Safford, made it their home. They had lived at the Hotel Columbus earlier in 1882. They continued to live at 313 Marlborough during the 1885-1886 winter season, but moved soon thereafter to Salem. On April 13, 1886, James Safford transferred the property to his mother, Nancy Maria (Potter) Safford, the widow of James O. Safford. She lived in Salem. By the 1886-1887 winter season, 313 Marlborough was the home of Dr. William Thornton, a physician, and his wife, Sarah (Gamble) Thornton. They had lived at the Hotel Oxford (southeast corner of Exeter and Huntington) during the previous season, and at 328 Dartmouth before that. He maintained his medical office at 3 Hamilton Place. They continued to live at 313 Marlborough during the 1887-1888 season, but moved thereafter to The Curtis at 43-47 Mt. Vernon. By the 1888-1889 winter season, 313 Marlborough was the home of Dr. George Hamlin Washburn, a physician, and his wife, Anna Marilla (Hoyt) Washburn. They previously had lived at 420 Columbus, where he also maintained his medical offices. They continued to live at 313 Marlborough during the 1891-1892 season, but moved thereafter to 302 Marlborough. 313 Marlborough was not listed in the 1893 Blue Book. Nancy Maria Safford died in March of 1893. On May 3, 1893, 313 Commonwealth was purchased from the estate of Nancy Maria Safford by Mrs. Sybil (Sibyl) M. (Jones) Crooker, the widow of Ralph Crooker, who had been superintendent of the Bay State Iron Works. She previously had lived at 321 Columbus. 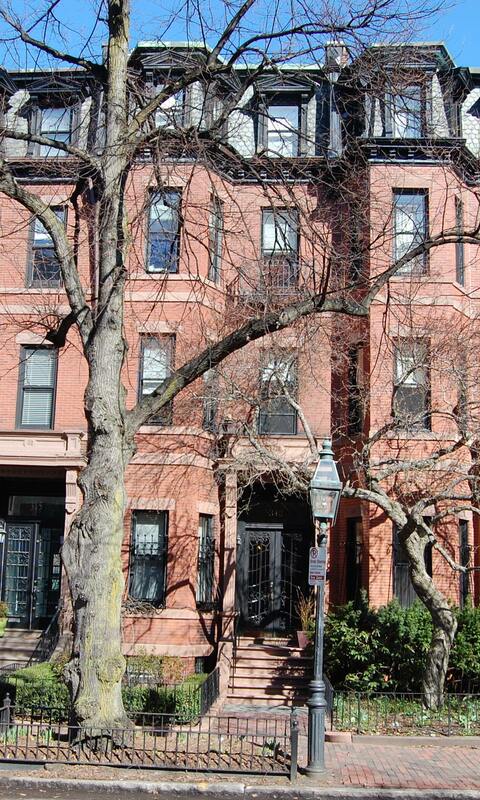 She continued to live at 313 Marlborough during the 1893-1894 winter season, but moved soon thereafter to 29 Newbury. On January 23, 1895, 313 Marlborough was acquired from Sybil Crooker by Charles Louis Flint, Jr. He and his wife, Rebecca M. (Burbank) Flint lived in Brookline. The house was not listed in the 1896-1898 Blue Books. On August 31, 1898, 313 Marlborough was acquired from Charles Flint by Elizabeth Mary (Clement) Smith, the wife of George Henry Smith. They previously had lived at 45 Mt. Vernon. They continued to live at 313 Marlborough until about 1906, when they moved to Kearsarge, New Hampshire, where Elizabeth Smith died in July of 1906. By the 1905-1906 winter season, 313 Marlborough was the home of Dr. Arthur William Doubleday, a dentist, and his wife, Nellie (Cotton) Doubleday. He also maintained his dental office there. They previously had lived at 235 Marlborough (both the Doubledays and the Smiths were listed at 311 Marlborough in the 1906 Blue Book, implying that the house changed occupants in the winter of 1905-1906). Nellie Doubleday died in April of 1909. Arthur Doubleday continued to live at 313 Marlborough, and on December 3, 1909, he purchased the house from George Smith. From about 1909, Arthur Doubleday was joined by his brother, Clark O. Doubleday, also a dentist, who lived and maintained his office there. Living with them, as a lodger, was Arthur S. Anderson, manager of a note brokerage. Arthur and Clark Doubleday continued to live — and maintain their dental offices — at 313 Marlborough during the 1910-1911 winter season, but moved thereafter to 226 Marlborough. On July 11, 1911, 313 Marlborough was acquired from Arthur Doubleday by Charles F. Barter. The house was not listed in the 1913 Blue Book. On March 28, 1912, 313 Marlborough was acquired from Charles Barter by attorney Burrill Devereaux Barker. He and his wife, Irene Fitch (Shepard) Barker, made it their home. 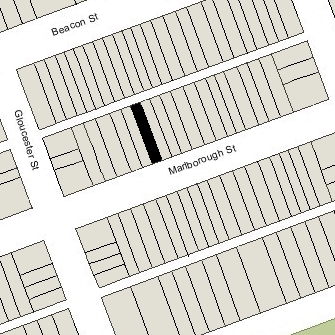 They previously had lived in an apartment at 138 Marlborough. They continued to live at 313 Marlborough in 1915, but had moved to 182 Bay State Road by 1916. He continued to own 313 Marlborough and lease it to others. By the 1915-1916 winter season, 313 Marlborough was the home of John Reed Post, a cotton dealer, and his wife, Mabel (Davis) Post. They previously had lived in Milton. They continued to live at 313 Marlborough during the 1919-1920 winter season, after which they moved to 257 Marlborough. On April 15, 1921, 313 Marlborough was purchased from B. Devereaux Barker by Junia Killen (Russell) Mason, the wife of Harold Francis Mason, a real estate dealer. They previously had lived at 403 Marlborough. They also maintained a home in Dublin, New Hampshire. 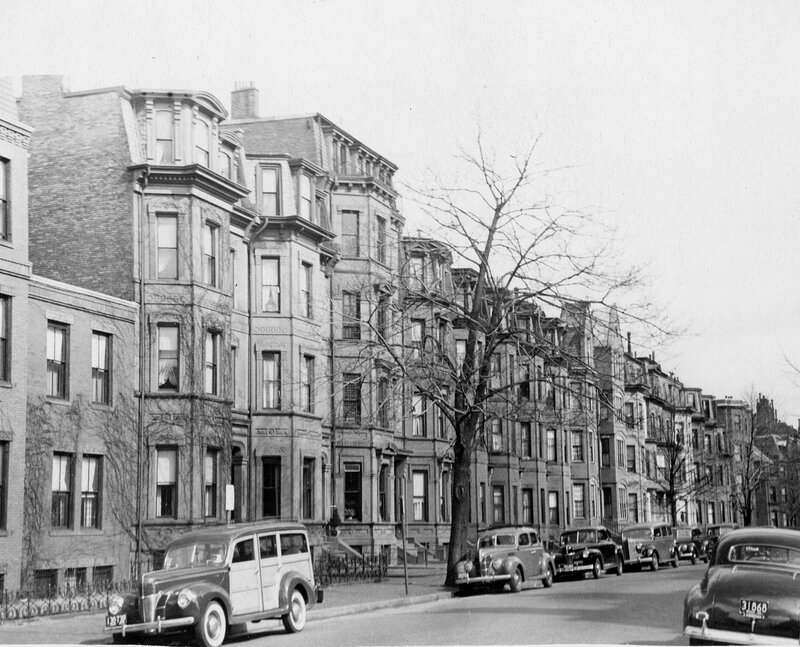 They continued to live at 313 Marlborough during the 1929-1930 winter season, but moved thereafter and by 1932 were living in an apartment at 380 Beacon. On June 21, 1930, 313 Marlborough was acquired from Junia Mason by William H. Potter, Jr., and his wife, Elvira (Boardman) Potter. They previously had lived at the Maryland Apartments at 512 Beacon. William Potter was an investment banker with The First Boston Corporation. On February 4, 1941, they transferred 313 Marlborough into Elivira Potter’s name. The Potters continued to live there until about 1950, when they moved to 360 Beacon. On October 18, 1949, 313 Marlborough was purchased from Elvira Potter by Mrs. Gertrude (MacFarlane) Fisher, the former wife of George Ellis Fisher. She previously had lived at 304 Marlborough as a lodger. Her daughter, Diana Duncan Fisher, lived with her. Her parents, Duncan McFarlane and Evaline J. (Knilans) MacFarlane, also lived with her until about 1962. In the 1960s, Gertrude Fisher was advertising director for I. J. Fox, furriers and dealers in women’s furnishings. In May of 1960, she acquired 395 Beacon, which she operated as a lodging house while continuing to live at 313 Marlborough. On June 13, 1969, she transferred the property to herself and her daughter, Diana Duncan Fisher. On October 21, 1975, 313 Marlborough was purchased from Gertrude and Diana Fisher by William Brunswick Bromell and his wife, Mary M. Bromell. Although she had sold the house, Gertrude FIsher continued to lived there until the early 1980s. She also continued to operate the lodging house at 395 Beacon (which she had sold in 1969). On February 15, 1985, 313 Marlborough was purchased from the Bromells by James M. Carney. In August of 1985, he filed for (and subsequently received) permission to legalize the occupancy as three units, asserting that this was an existing condition for at least the past ten to fifteen years. 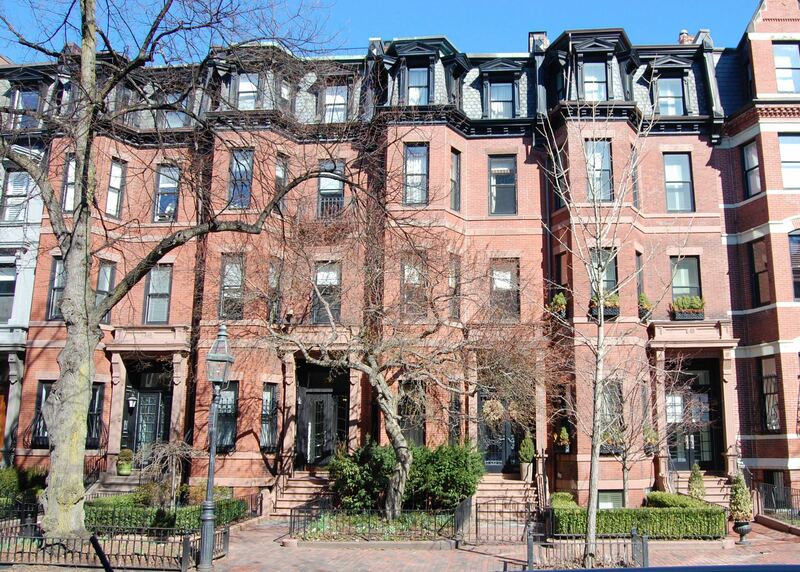 On August 14, 1986, he converted the property into three condominium units, the 313 Marlborough Street Condominium.